top: the long border that runs along the top of The Wildflower Meadow. above: maturity has its advantages: a mini garden growing over an entrance. above: a delightful combination of geometry and chaos, informal and man-made, the random rectangles of York paving anchor the natural style plantings in The Flower Garden. 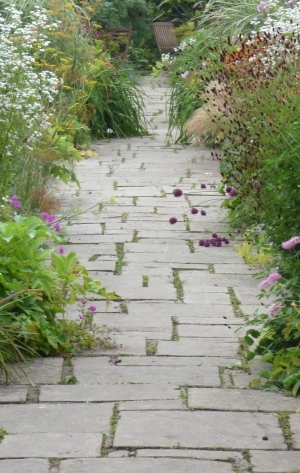 small alliums and burnets playfully spill onto the path. above: dahlias, cannas, lychnis, poppies and verbenas inject color and bold foliage into The Flower Garden. The main event on Day 1 of my Summer tour of British and Dutch gardens was a fancy dinner at Gravetye Manor with other American gardeners (Jeannine Zenti, Mike Collins and Frank Eddy ), to refine the details of the tour ahead and explore William Robinson's groundbreaking Sussex garden, which is only possible with a reservation. 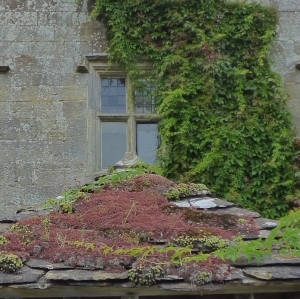 above: a view from The Flower Garden of Gravetye Manor, now an award winning, Michelin starred restaurant and hotel. Built in 1598, the same year as Borde Hill , it became the home of 'the Father of the English Flower Garden', William Robinson, in 1884. Robinson rejected labor intensive formal gardens and beddings of garish annuals in favor of a simpler, more natural approach incorporating local and climate appropriate species. In 1904, writing for Country Life , he berated Kensington Garden's "[s]hocking combinations of color... such as blue lobelia, scarlet geranium, mauve verbena, with purple and variegated fuchsias, all crowded together within an area of a few feet, distressing in their warring shades." A man after my heart. above:Jeannine faces the long border, while Frank views the countryside past The Wildflower Meadow. Inulas provide the gold, while phlox, persicarias, and lychnis give pastel pinks and whites. Robinson was wildly successful as a gardening journalist. His most famous book, The Wild Garden, published in 1870, positioned him to start his own magazine, The Garden. Notable contributors included Oliver Wendell Holmes, William Morris, and his dear friend and professional associate of over fifty years, Gertrude Jekyll, who edited The Garden for a couple years. 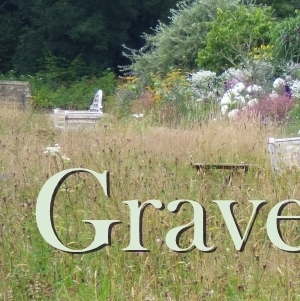 His writing afforded him the money to purchase Gravetye, where he had the room (and a lovely microclimate on a south facing slope) to put words into ground. 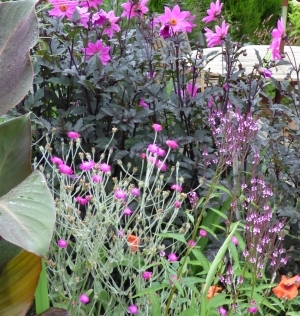 above: another view of the long border, dominated by harmonious purple, lilac and white tints. the restraint used in placing the deep purple gladiolas provide magical slashes of vertical color without falling overboard. warm colored crocosmia and digitalis prevent the palette from wilting into afterthought. I introduced myself to head gardener Tom Coward, whose previous service at Great Dixter formed a type of loop, as Christopher Lloyd's mother was a follower of Robinson's, and Jekyll an early influence on young Lloyd. I found Coward tending peaches in a glass house, on my way to one of the world's last active Victorian walled kitchen gardens. Alas, in my over-excitement and the dying daylight, I took no pictures. To do it justice would have required climbing a tall tree or comandeering a helicopter, but what a marvel it is. At 2 acres, it provides nearly every bite of produce for the restaurant, and cut flowers for the hotel (for those of you growing sweet peas, here's a helpful tip to get more flowers ). While influenced by Robinson and Jekyll, Lloyd did not feel bound to restrict Great Dixter to beds of harmonious palettes, and it appears some of his adventurous use of color arrived with Coward to Gravetye. However, with a skillful hand, Coward evolved the beds and borders with new color ingredients- saturated gladiolas, dahlias, heleniums, kniphofias and salvias- while retaining a wild and natural expression.